I was seeking the elusive Resplendent Quetzal, a bird so rare and exquisite, the ancient peoples of Mesoamerica worshipped it as God of the Air. 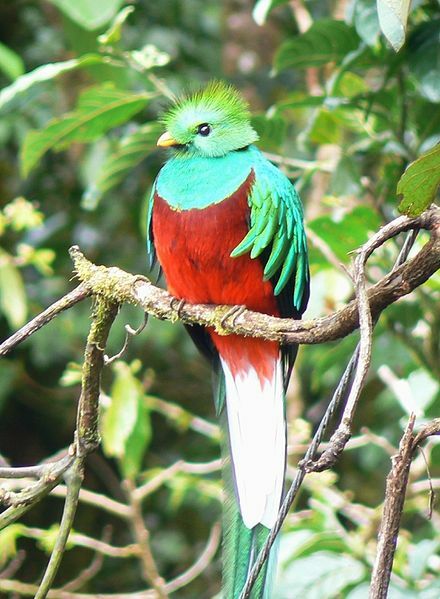 Today, the Quetzal is one of the most coveted feathers in the bird-watcher’s cap. This lovely bird lives in the Central American cloud forests, tropical rainforests so high in the mountains, they are perpetually shrouded in mist. “Cloud Forest.” The very name conjures up wonder and mystery. What a fitting home for this celestial little creature. 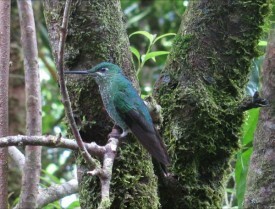 I had come to the Monteverde Cloud Forest in the highlands of Costa Rica. Unfortunately, I had come to Monteverde with a tour group of noisy sightseers. I usually enjoy the company of fellow travelers, but today I glared at them resentfully. Didn’t they understand I was on a mission? How were we supposed to find this shy little bird when our group members chattered louder than the howler monkeys who also inhabit the Costa Rican jungles? Gaston, our tour leader, led us to a viewing platform hung with nectar-filled red globes which were bombarded by dozens of bright hummingbirds. The jewel-like qualities of these tiny birds were reflected in their names – the Purple-Throated Mountain Gem, the Green Violet Ear, the Green-Crowned Brilliant, and the Violet Saberwing. 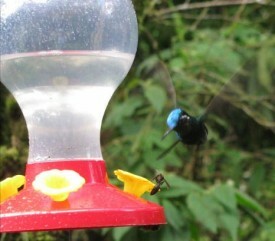 The hummingbirds were delightful, but viewing them at the feeders was cheating. I am a Birder! We don’t need no stinkin’ feeders! We find birds in their natural habitat! At the edge of the forest, we split into two groups. I looked with a touch of pity on “Wimpy Group” who wished only to take a little stroll along a path in the woods and then hang out in, of all places, the gift shop. My group was made up of the hardy, the serious, the intrepid explorers ready to brave the mud, the drizzle, the bugs and snakes, to delve deep into the secrets of the jungle. Two naturalists would direct our quest. Andreas was a charmer – tall, dark, and so cute, he actually made dreadlocks look attractive. José, a small man in an Indiana Jones hat, stood silently to the side, peering through his scope. They led us up a muddy path to an overlook above the aguatillo – the wild avocado trees that are the Quetzal’s favorite food. We scanned the thick woods, searching for the flash of iridescent green or blue, the flaming red chest, the long streaming tail feathers and cute Mohawk topknot that characterize the Quetzal. 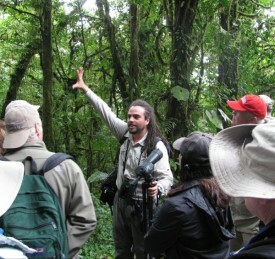 Andreas filled our anxious minutes with stories of the cloud forest and of the other creatures who lived there. But I wasn’t here for stories. I was here to see the bird. José was of the same mind. Five of us left the larger group and followed him. A narrow, winding path, overhung with vines and wild orchids, took us deeper into the dark forest, down to the aguatillo grove where we hoped to spot our species. Was he kidding? How could he possibly determine the species from those brief glimpses of nondescript, little brown birds? Was it cheating, I wondered, to include birds I didn’t identify myself on my own very short Life List? Right when I was beginning to think the day would be just one long walk in the woods, José suddenly stopped us with a finger to his lips. He aimed his scope at a tree, far off in the forest. Was this our Quetzal? My heart quickened as I stepped up to peer through the scope. Through the lens, I could clearly see – no, not the Quetzal – but the head of a baby hummingbird, a Purple-Throated Mountain Gem, peeping out from his nest. It was not the bird I had set out to see, but this tiny creature was a still a miraculous sight that almost made up for the failure of our quest. After more than two Quetzal-less hours of tramping through the jungle, we returned, tired, wet, and disheveled, to our waiting vans. “Wimpy Group” was already seated, dry and chipper, bags of souvenirs on their laps. I plopped down next to one of the women and sighed. Joan Lindsay Kerr is a world traveler who has recently discovered a love of birdwatching. A former middle school English and history teacher, she now serves as the Curriculum Specialist for a school district in Bakersfield, California and as president-elect of the California Association for the Gifted. You’ll find more of her adventures on her online travel journal at travelswithrobby.blogspot.com. Joan originally wrote this story for Dave Fox’s online travel tale writing class.